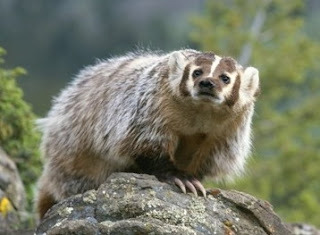 A rather large, robust, short-legged "weasel"; body broad and squat; tail short, thick and bushy, usually shorter than the outstretched hind legs; pelage long and shaggy, especially on back and sides; upperparts grizzled grayish-yellow in color; a distinct white stripe from near tip of nose back over top of head to shoulder area, also a white crescent on each side of face just back of eye and another at anterior base of ear, enclosing or outlining a large blackish area; snout and rest of head grayish or blackish; under parts yellowish-white; feet blackish; five toes on each foot; front feet large, with claws 25 mm or more in length; hind feet smaller, claws much shorter; skin loose on the body; eyes and ears small; neck short. Dental formula: I 3/3, C 1/1, Pm 3/3, M 1/2 X 2 = 34. Young similar to adults in color and color pattern. External measurements of adult male: total length, 788 mm; tail, 133 mm; hind foot, 120 mm; female, 730-150-114 mm. Weight of adults, 4-10 kg, averaging about 7 kg. Found across state except in extreme eastern part; may be extending its range eastward in connection with changing land-use patterns. Badgers occupy a variety of habitats. It ranges over most of Texas except for the extreme eastern part of the state, and recent records suggest it is expanding eastward as a result of land-clearing operations. 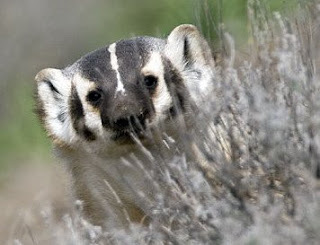 Badgers are most common in the prairie and desert sections of the West, but limited numbers venture into the mountains where individuals have been seen or captured at elevations well above 3,000 m. In general, they occupy the entire range inhabited by ground squirrels and prairie dogs on which they rely in large measure for food. In Texas, they range from sea level, as on Padre Island, to at least 1,500 m in the Davis Mountains. As suggested by the disproportionally long front claws, badgers are expert diggers and their short, powerful front legs can move earth with amazing speed. 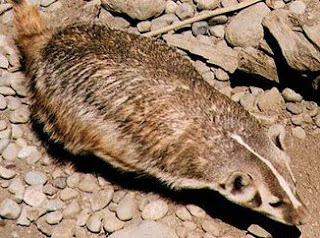 A badger was encountered on Padre Island as it sought refuge in a shallow burrow in a sandbank. Three people, working frantically with shovels for more than an hour, were so outdistanced in their race to capture the animal that they gave up. It is a common belief that badgers hibernate in winter, but such is not the case. 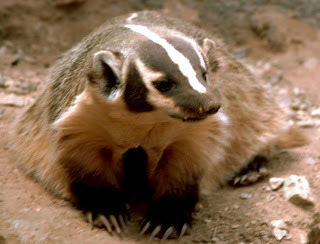 They may sleep through several days of inclement weather, as do skunks and bears, subsisting on fat stored in the body but they do not experience the physiological changes characteristic of true hibernation; namely, considerably reduced rate of respiration and heart beat, lowered body temperature, and insensibility. They are frequently encountered in winter, particularly on mild days, and in the southern parts of their range they are active throughout the entire year. As indicated above, the chief food of badgers is ground squirrels. In addition, pocket gophers, kangaroo rats, other burrowing rodents, and cottontails are dug out, caught, and eaten. 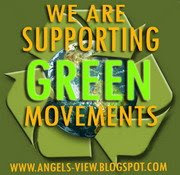 They also eat lizards, birds, eggs, insects, and occasionally carrion. 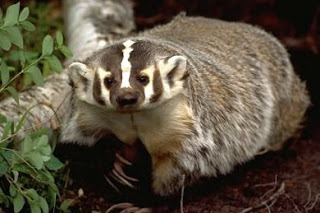 Badgers are ordinarily solitary except during the mating season. They breed in summer and early autumn. Males are probably polygamous and mate with more than one female. Implantation is delayed until between December and February, and the young are not born until March or April. Litter size ranges from one to five, averaging about three. The young are born in an underground nest and are lightly furred and blind at birth. The eyes open at 4 weeks, and weaning occurs at about 8 weeks of age, when the young are half grown. The young remain with their mother until late fall, when the family scatters. 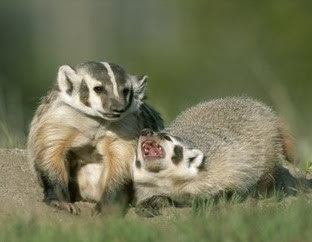 Badgers have few natural enemies other than man. They are ferocious fighters and are usually more than a match for any dog. In one recorded instance a badger successfully defended itself in a fight with two coyotes. 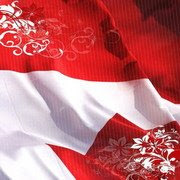 The fur of the badger ordinarily does not command a high price and, because of this, relatively few are trapped. Data indicate that the population is now increasing except in those parts of the animal’s range where poison is used ostensibly to reduce the population of coyotes. The badger’s chief value lies in helping to keep down excessive populations of rodents.